Steenee in game: 383 Who? Important notice! 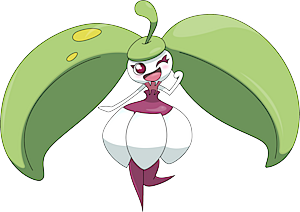 Pokemon Steenee is a fictional character of humans. Steenee (Japanese: ????? 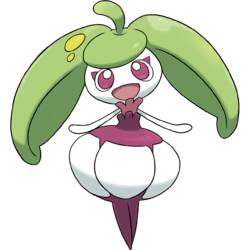 Amamaiko) is a Grass-type Pokémon introduced in Generation VII. Steenee is a bipedal, plant-like Pokémon with a humanoid appearance. Its torso and legs are dark purple, while its hips, arms, and head are all white. It has dark purple eyes with purple, triangular markings over them similar to stylized eyelashes. On top of its head is a large, light green calyx. The calyx has short leaves on the front and back, two large leaves out to the sides similar to pigtails, and a short stem on the top. The right leaf has two yellowish-green spots on it. The upper part of its torso has short ruffles similar to a dress, and it has wide hips made up of six segments. Its slender arms have slightly rounded hands with no visible digits, and its legs have pointed tips. Steenee, its pre-evolution, and its evolution share their category with Tropius. They are all known as the Fruit Pokémon. Amamaiko may be a combination of ?? amai (sweet) and ?? maiko (dancing girl).